Review written by and copyright: Samuel Scott (9th January 2015). NIGHT MOVES is the story of three radical environmentalists coming together to execute the most intense protest of their lives: the explosion of a hydroelectric dam—the very source and symbol of the energy-sucking, resource-devouring industrial culture they despise. It is a tale of suspense and a meditation on the consequences of political extremism. When do legitimate convictions truly demand illegal behaviours? What happens to a person’s political principles when they find their back against the wall? 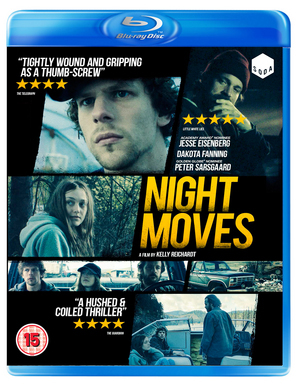 Distributor Soda Pictures have followed up their impressive 2014 "Kelly Reichardt Collection" with "Night Moves" starring Jesse Eisenberg and Dakota Fanning. The film is presented in the original aspect ratio of 1.78:1, and receives a 1080p transfer using an AVC MPEG-4 encode. "Night Moves" is a film where many scenes are shot in the dark and in shadowy situations, yet I have to say that I didn't notice ay crush at all here. Although shadow details sometimes struggled to get through, there wasn't any major issues and clarity was surprisingly strong at times. Some sources seem to say that the feature was filmed on digital, but it certainly looks like film thanks to a fine layer of natural looking grain running throughout. It never appears noisy, but some of the darker scenes do have a heavier and more noticeable grain structure than daylight scenes. Colours feel drained to fit in with the surrounding environments, and suits the tone well, whilst skin tones remain accurate at all times. Facial close-ups look excellent, with fine details showing great clarity and sharpness. Longer shots, particularly scenic ones during daylight, also show high levels of detail and depth. There are no major issues with the print here, though I did notice some minor compression artefacts at 99:26. No aliasing, edge enhancement, or obvious signs of sharpening / digital noise reduction were noticeable. The feature is uncut, and runs 112:47, including a Soda Pictures logo at the start. For my viewing, I opted to watch the film using the English DTS-HD Master Audio 5.1 track which was a very subtle experience. The sound design is quite heavily focused towards the front, mainly because of the settings and situations the characters are in, and often, there are actually some reasonably long quiet periods. However, the surrounds do make a few gentle appearances outside of the score by Jeff Grace, with slight environmental noises feeling surprisingly immersive at times against a quiet backdrop. Volume levels are consistent, and channel separation and directionality good. Dialogue is crystal clear at all times, and there are no issues to be found such as drop outs, scratches, pops, or background hiss. Optional subtitles are included in English for the hard of hearing. The Reichardt interview is audio only, and seems to have been done over a phone judging by the background 'coffee shop' noise. Still, she is easy to understandable throughout and discusses various elements of the movie including how she built certain scenes up during the editing process against her own 'rules', how she is intrigued by particular groups (in this case environmentalists), and plenty more. You do hear the interviewer at a couple of points, but he is very quiet. The rest of the interview has cut him out. The Eisenberg interview is closer to that of a quick interview you would see on a fluff piece on television, with interview snippets joined by film clips. He gives quick sound bites about his character, the story, and the unusual filming process used by Reichardt. Next up, we have a short film taken from the main feature entitled "A Film by Jackie Christianson" (1:24). Directed by Larry Fessenden, it is narrated by Clara Mamet and features music by Just Desserts. It sort of has a student project feel about saving the planet. A nice little extra to have included, but not something that will receive repeat viewings. The rest of the extras are self-explanatory. Soda make a bright start to 2015, with another solid release of a Kelly Reichardt feature.